The Land Cruiser is so old school that it makes you do everything but clap the erasers at the end of your drive. My wife spent a couple of minutes scanning the dash and center console hoping to find the electric parking brake release switch. But the Land Cruiser doesn't have an e-brake button because its center console is fitted with a big fat mechanical lever, just like the ones they taught you how to use back in driving school. The list of retro provisions continues when you open the tailgate. 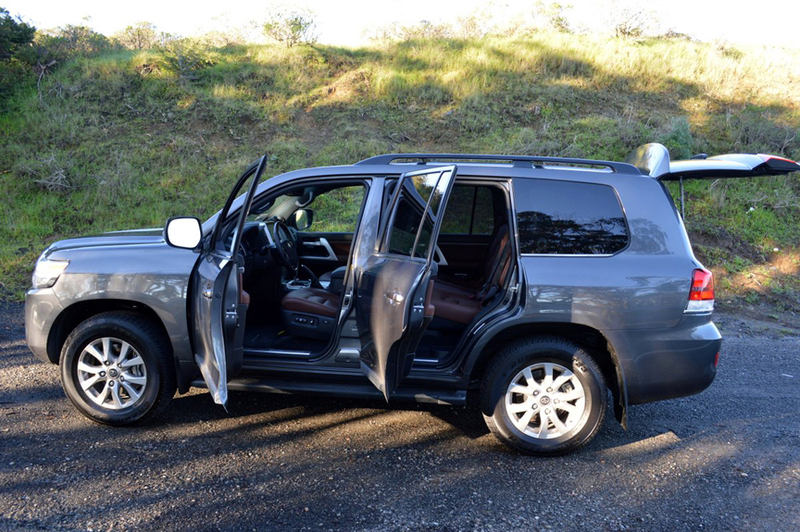 The Land Cruiser has a double action gate. The switch on the dash (or the remote) only lifts the upper half of the rear door. The lower section must then be released by pulling a chrome lever arm located on the bottom door. 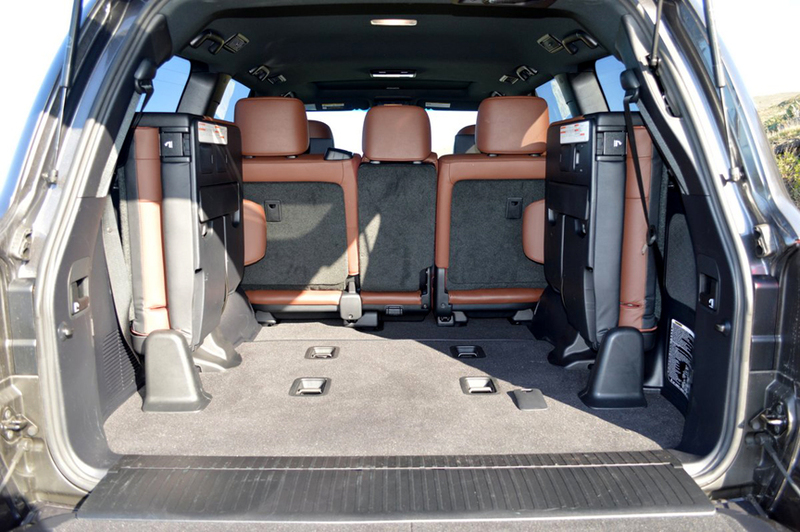 Once you gain access to the Cruiser's aft compartment, you'll notice that two folding seats are positioned against both sides of the rear cabin walls. These seats intrude significantly into the Cruiser's 81.7 cubic foot storage bay. Although the seat backs of the second row seats do fold flat, doing so still leaves a significant ledge which further eats into usable storage space. For all these reasons, I found it surprisingly difficult to insert a mountain bike into the Cruiser without undue fuss. While the second row seats can be made to tumble home against the back of the front row seats, you must secure them with provided straps. 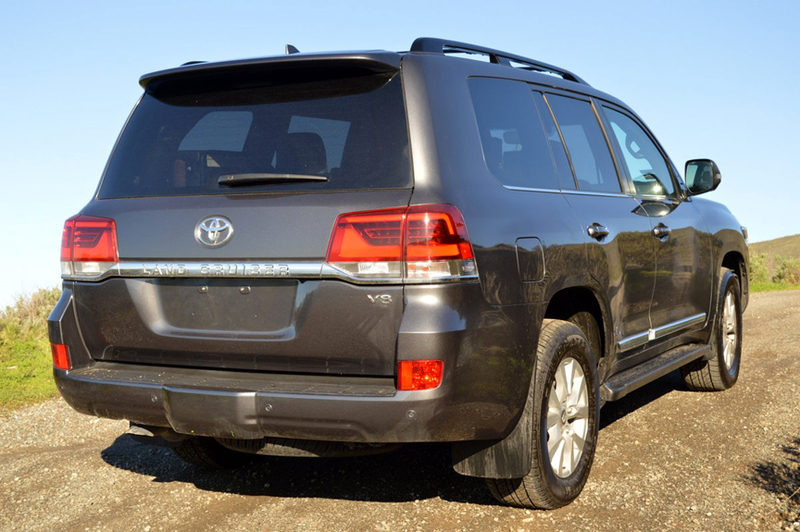 Clearly, the Land Cruiser is not going to compete with a Honda Odyssey or Chrysler Pacifica for ease of storage. It's more Stow it Slow than Stow 'n Go. On the other hand neither of those low slung minivans will ever follow the Land Cruiser off road into wilderness territory. This ability to trek where other vehicles dare not tread has always been the strong suit of the Land Cruiser. The brute force needed for wilderness exploration is provided by the same 3UR-FE 5.7 liter V8 Toyota installs in its top echelon Tundra truck. This under-square unit (its 94mm bore is smaller than its 102mm stroke) produces enormous torque of 401lb.-ft. at very low rpm, as well as 381hp. The Cruiser will tow up to 8100lbs., so it's a logical candidate for transporting a medium size house trailer. Full time 4 Wheel Drive takes care of traction in any weather. At each corner, sizeable 285/60R18 Dunlop Grandtrek tires distribute the Cruiser's ample power without slippage. 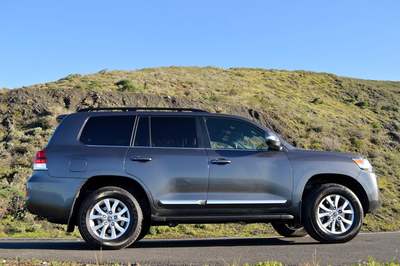 The underpinnings of the Land Cruiser are what make it bullet-proof off road. All the basic building blocks are included here: locking limited slip center differential, kinetic dynamic suspension system, multi-terrain selection dial, crawl capability, and off-road turn assist. You will have a hard time finding a locale inimical to the Land Cruiser. But in normal driving around town, this weighty piece is rather ungainly. Its curb weight (5,855lbs. ), length (195in.) and height (74in.) all conspire to make it difficult to park in a world geared to "compact" vehicles. But on the freeway, the Land Cruiser is a bastion of comfort, an observation platform without compare. The exterior rear view mirrors are absolutely huge, in anticipation of towing needs. In normal driving, these generous mirrors pair with an enormous rear window to afford sensational vision in every direction. Because the Cruiser stands so tall and utilizes so many large panes of glass, you automatically become one of the best informed drivers on the road. 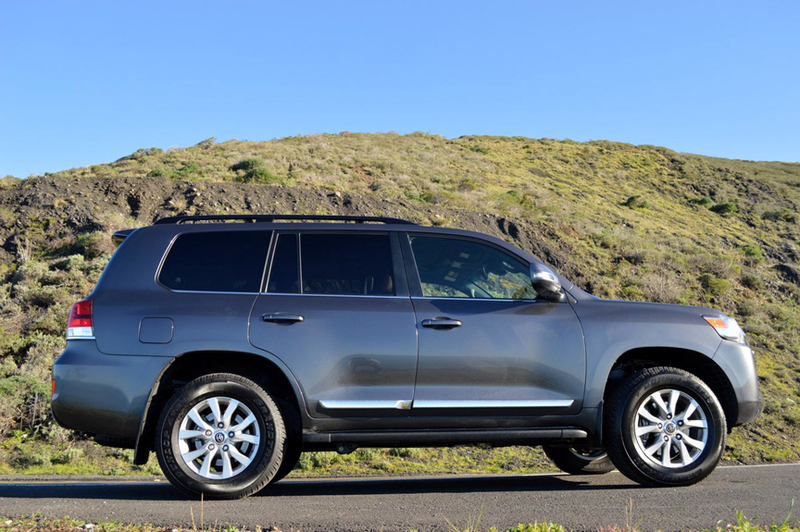 While Toyota provides the Cruiser with a complete suite of safety nannies (blind spot warning, automatic emergency braking, rear cross traffic alert, lane departure warning), the beauty of the Land Cruiser lies in its old school placement of all the driving tools you need. The stick shift, for example, is a stout tree of a device sprouting from the console between the front seats. It utilizes the time honored "PRNDL" layout with an easy to find enhancement for manual operation. The placement of the lights, wipers, defrosting, heating and cooling controls are instantly find-able because they are logically placed. The only item Toyota buried here is the gas filler door release which is inexplicably hidden, unmarked, underneath the dash. 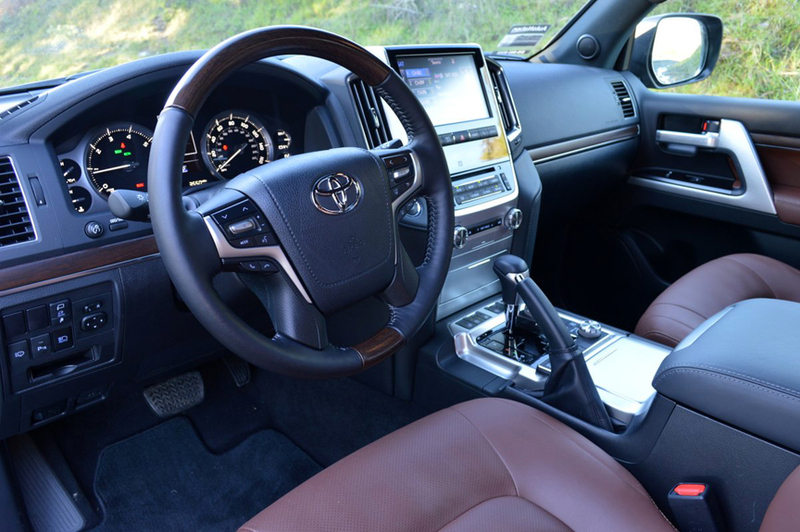 To be sure, the Land Cruiser does incorporate all the infotainment functions in a menu driven system called "Entune Premium" which utilizes a 9 inch screen for smart phone style operation. But the fact that all the crucial operational features are still button controlled makes me hopeful that this Toyota will never graduate from school.